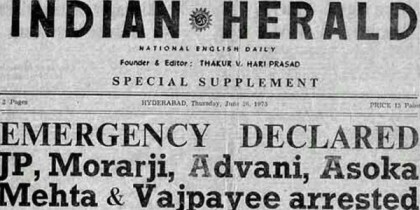 The Emergency was the blackest period in the history of independent India. An authoritarian regime, bent on perpetuating its rule by any means whatsoever, resorted to enacting draconian laws and suppressing people. Political opponents were put in jail for no fault and the media was totally gagged. The Madhya Pradesh government under Shivraj Chauhan had started the Lokanayak Jaiprakash Narayan Samman Nidhi Niyam in MP in 2008, under which about 2,000 persons jailed during the Emergency receive a monthly honorarium of Rs 25,000 a month. It needs to be stated that the beneficiaries of the scheme were not only from the BJP but from across the political spectrum opposed to the Congress. But the new Congress government in the state, headed by Kamal Nath, who was a member of the infamous coterie that was built by late Sanjay Gandhi during the emergency and that functioned as a roving extra-constitutional authority, has put a stop to these pensions. The reason given is that the scheme needs review and verification of the process of identifying the beneficiaries, but it is clearly an act of political vendetta. But does Nath have any other choice? Is he expected to pay pensions to people who were interned by the party he represents? More so, when he was part of the decision-making machinery then when they were jailed? If Nath had continued with paying the pensions, it would have amounted to admitting that the Emergency was, in fact, a bad thing and the pensioners were in fact wronged by being jailed. No hard-nosed and cunning political leader would ever do that. Nath can hide behind the plea that the BJP government had rewarded its own members with the pensions for the troubles they had to undergo during the Emergency and that it was a political scheme intended to open old wounds and defame the Congress. He has said that the scheme would be restarted after making it “accurate and transparent”. But it is clear that it will be given a quiet burial. The fact is that people were indeed jailed during the dark period, just for being political opponents of the then Czarina and her son. They were picked up and locked up so that no political movements could take place against the dictatorial regime. It is wrong to stop the pensions that seek to right the wrong done to these people by the Emergency.